Mandelbulb 3D v1.91 Released - With Mesh Module!! I'm very pleased to announce that the latest version of Mandelbulb 3D - v1.91 - has been released by Andreas - AKA Thargor6. The big news of course - and this is something I know lots of users have been asking for - is the addition of what Andreas has termed the 'BulbTracer'. This will allow the creation of exportable 3D meshes directly from M3D! "Here is the new MB3D release with the first version of a new module called "BulbTracer" to easily create meshes from within MB3D. Its supports the complete workflow of creating, smoothing and previewing the meshes, so no additional software is required. It works fully multi-threaded, so it is fast, too. - to get started quickly hust hit the "Generate Mesh"-button and watch what happens. You should get a small preview window showing the mesh if all worked right. you can still create the meshes, but not preview them from within MB3D. You may use MeshLab instead. vertices and faces are generated, leading to larger files and more consumption of memory. Great Feature, I work every day and have fun! Hi! I've this trouble when I try to open certain formulas. This warning shows me: _FoldingTetra3d formula is missing! (Check Ini-dir for formulas). When I see inside folder I find formulas, but still I've this warning. What means? Thanks for help. cool feature and save time (no voxel export > fiji and so on). If nothing is to see after "import from main" > scale down with "Overall scale" until something is to see. Then find the area of interest - adjust it to the middle and scale up, so that it fits to the preview window. Best results with a closed mesh already in "Trace Preview" (best view with 256³ - only if slow go down). If you have noise, holes and/or to fine lines, take a look to DE value - is often to small. my setups mostly outside meshes. check the In/out option. With higher "Volumetric resolution" meanwhile i deactivate "Oversampling" and "Taubin smooth", because mb3d hangs up in some cases. Higher Volumetric resolutions means 400-512 (for me ). i smooth and reduce the mesh-polys in cinema4D and also meshlab (free) does it. Thanks for posting. I just installed and am really liking what I see! Mandelbulb 3D v1.90 Released!Hi there folks! Just in case some of you were unaware; Andreas - AKA Thargor6 - has now released version 1.90 of Mandelbulb 3D. - Support for animated (height)maps! They are defined in the "Map Sequences"-window in the Prefs-section and saved as local properties, i.e. you may use them independently of a specific set of fractal params. I liked the image above just like it is. A new 'Toy' for M3D! !Hi guys! First off; let me wish you all a - slightly belated! - Happy New Year! Now, to the point; I recently discovered - via Kronpano's :iconkronpano: excellent piece 'Sierp Hilbert Construction Site': http://fav.me/d72bcaa that it's possible to create interactive 360 degree images of M3D - and doubtless also Mandelbulber and Frag - pieces. The process uses a facility provided by 'fieldofview.com', which is accessible through a Flickr account. I personally have never been a great one for making vids of my M3D creations, so finding this feature was like manna from heaven for me! Basically, you'll have to have, or open a Flickr account: http://www.flickr.com/ to upload your images to. As most of you will be aware, M3D has a 360 degree view option within the Navigator; use this to create your panoramic 'base' piece. Mandelbulb3D 1.9.0 ALPHA 1Andreas :iconthargor6: was even faster than I thought, he already released an amazing incredible ALPHA of a new Mb release, believe it or not. - Started to increase the number of formulas from 6 to 8. ( !!!) Many changes are already done, but not all. Unfortunately most required changes are only detected by crashing the program. It was necessary to create new revisions for all file-formats involved, currently only saving in the *m3p-format is supported. Mandelbulber v2.02 Now Available!Hey guys! I'm happy to announce that the finished version - v2.02 - of this superb 3D Fractal renderer is now available for free download! "This is first release of Mandelbulber v2. The program was rewritten from scratch to have a nicer Qt based user interface. I hope you like it. What is new compared with the old Mandelbulber? - most edit fields have sliders to set value by mouse. Edit fields where range of value is very high, have a slider with logarithmic scale. Mandelbulb3D may well be getting a fairly radical makeover at some time in the - hopefully! - not too distant future! Developer Valera Rozuvan, a member of FractalForums, has announced his intention to 'Remake' MB3D. "OK guys! Prepare yourself for one amazing ride! The MB3D project will be rebooted, and I am going to spearhead the development. 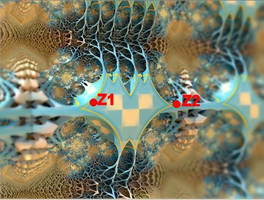 Update with formulasAdded new "3d mandelbrot" formulas. Good news huh? The Amazing Surf 2 was wrong, the fold shape was not symmetric like it was supposed to be. New M3D Formulas from ~dark-beam!Hey Everybody! Just a quick heads-up to let you know that our Mandelbulb 3D formula wizard, 'dark-beam'; after a well-deserved sabbatical, has now returned to active service, and has written some fascinating new formulas for our much loved prog! Note: before downloading you should perhaps rename it, say; 'new fmlas2.zip', in order to avoid overwriting the original .zip file. Got your ears on Luca? Mandelbulb 3D version 1.8.9....with Volumetrics!VOLUMETRICS in M3D!!!! already a superb piece of fractal software! contest so here it is....and I need some rest! Please look at the readme for some explanations for the new volumetric function. - Formula update, some sine approximation adds with more options." I suspect that we'll be seeing a lot of amazing lighting effects over the next few weeks! Note: these are not the holy grail settings for reflections and transparency. They are what this is called: a quick and dirty approach for those who (like me for a long long time) need a place to start and experiment from. All in here is based on what I found out myself or what I was pointed to by kind fellow DA-members. If you find fault with it, have additional tips or whatever, please drop me a note Also, please remember, I am not a native speaker. Either ignore spelling- and/or grammar-mistakes or (even better!) point me to them if you like! An amazingIFS guideA little guide on how to use amazingIFS formula on Mandelbulb 3D. Here is a simple procedure on how to obtain these caracteristic “kleinian” shapes or however they are named with a simple heightmap. This mini tutorial can be done with any other dIFS shapes tough, like SphereIFS, etc. Don't forget to add the map to the working folder you have for Mandelbulb 3D! I've lowered the max. Iterations to 25 in the formula window to speed things a bit up but you can change it later if you prefer to do so. Add amazingIFS to the second slot.Just set all rotation X, Y and Z from default 5 to 0, and change Fold X, Y and Z values to 1. Mandelbulb 3D Tutorial 5: Tips and TricksFrom time to time, I still manage to stumble across new 'tricks' in MB3D. I'm sure some of the following tips are known to others, but for those that haven't discovered them, I hope they will help in the future. Some of these were discovered accidentally, others were found through desperation while trying to solve problems. The first one is very simple and just a little bit of a time saver. An Amazing Surf 2 GuidelineMany people went a bit frustrated on not getting anything “cool” from the new Amazing Surf 2 formula recently made by Luca, aka dark-beam :icondark-beam: for Mandelbulb 3D. I've assumed that you already put on the first slot the Asurf2 formula. MandelBulb3D DEcombinate Mix Mode TutorialHello everyone! Glad to see you all around! I've been testing new possibilities in Mandelbulb3D and I found easy and clever way, how to save your render time to make fabulous and outstanding pieces. Let me explain you what I'm talking about here! As the title says, there's a "Mix" mode in DEcombinate function. It remained unused for quite a time. It's time to make revolution. First of all, let's start with something basic, like bulbs! I will explain each step and every single thing to make you understand the technique! Ok, Let's go. 1. In first formula slot place _AmazingBox formula, and keep it unchanged for now. 3. Now what we exactly need to do is turn DEcombinate on and choose Mix mode! Mandelbulb 3D v1.91 Released - With Mesh Module! !Hi there folks!